Oceola Landing | Successful Grand Opening! 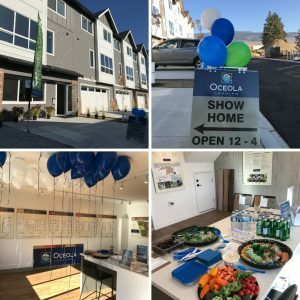 SUCCESSFUL OCEOLA LANDING SHOWHOME GRAND OPENING! Affordable Home Ownership In Lake Country Starting From $449,000! 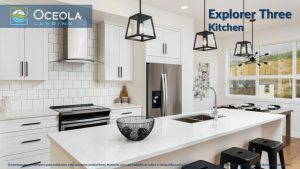 The response at Oceola Landing has been overwhelming, and we just hosted our highly successful Showhome Grand Opening Event on Saturday October 20th to introduce this wonderful community of 61 townhomes in picturesque Lake Country. We had 42 groups come through and 125 people in total! Stay tuned for the winner of the Sparkling Hill Grand Prize Draw! 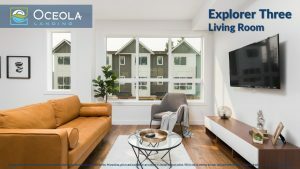 Oceola Landing offers all of the benefits of Okanagan living at affordable prices with the enjoyment of city culture, as the area has all the amenities you need without losing its rural charm. These 3 storey-homes range from 1544 sq.ft to 2643 sq ft, and feature open concept design, spacious 9 ft main floor ceilings, oversized windows throughout, quartz counter surfaces, energy efficient heating & central air-conditioning, and stainless-steel appliances. A standout feature of these townhomes are the solid CONCRETE dividing walls giving you a high degree of soundproofing and safety. Each home has a private double car garage with additional parking space on every driveway, and the yard is fenced! The best part.. you’re literally STEPS away from the Lake and other Okanagan luxuries. Visit our show home at 12075 Oceola Road! We are open Tuesday to Saturday from 12-4pm or by appointment. Please call our Property Specialist at 250-609-0488 or email oceolalanding@fortunemarketing.ca for more information!